A fast acting, concentrated pad cleaner that quickly dissolves and emulsifies compounds, polishes and waxes to make cleaning fast and easy! Cleaning your pads removes all kinds of chemicals that have been embedded into them during the buffing process. This can include all types of solvents, carrying agents, abrasives, petroleum distillates, silicones, chemical cleaners and other nasty substances. Removing the liquids and the solids that build up both on and inside of your buffing pads preserves their integrity. Wolfgang Pad Werks Polishing Pad Cleaner breaks up and releases spent product, contaminants and dirt, leaving pads clean and ready for future use. Wolfgang Pad Werks Polishing Pad Cleaner breaks up and releases caked on polish and wax residue from all foam, wool and microfiber pads. As you’re buffing, product residue and paint are becoming embedded on the face of the pad. As you continue to buff, your pad clogs up and this dilutes any fresh product you add for the next section you buff. This not only wastes product but it also prevents the pad from performing to full potential. Any leftover compound or polish residues have the potential to undo all your hard work if not removed from the pad. Residue solids can be re-introduced to the body panels where they can cause swirls. The best way to avoid cross-contaminating your pads is to remove all previously used compounds and polishes using Wolfgang Pad Werks Polishing Pad Cleaner. The best time to clean your pads is right after using them while any compound, polish or wax residues are still wet. 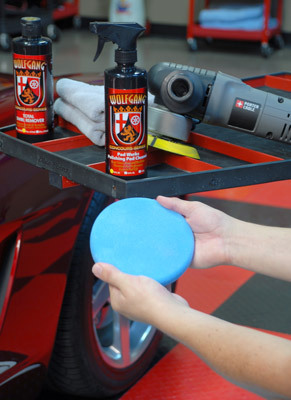 Wolfgang Pad Werks Polishing Pad Cleaner utilizes a powerful cleaning agent that will quickly mix with the wet residues and emulsify all types of water-in-oil and oil-in-water suspensions so they will release their glue-like hold on foam, wool and microfiber pads. Once the bond has been broken, compound and polish residues can easily be brushed out using a pad conditioning brush for foam pads, or when using a steel spur for wool pads. Cleaning old, dry pads where the compound, polish and wax residues have been allowed to dry completely requires a powerful cleaning agent to re-liquefy and then dissolve the dried residue into a form that can be removed. Wolfgang Pad Werks Polishing Pad Cleaner’s powerful re-wetting and degreasing agents go right to work penetrating into even the driest caked-on gunk to make removal fast and easy. Spray Wolfgang Pad Werks Polishing Pad Cleaner liberally onto face of pad and allow to penetrate for 1-2 minutes. Agitate cleaner into foam to mix with residues so emulsification can take place. For wool pads, agitate cleaner into matted fibers so cleaning agents can saturate and separate residues from fiber strands. Scrub foam pads using a pad conditioning brush to loosen polish and compound residues from the face of pads where solids build up. Squeeze foam pads to flush liquid residues out of foam cells. Flush remaining residues out of buffing pads in a sink or bucket of water. Use a second rinse bucket with fresh water for a final rinse. If running water is available, hold pads under running water and squeeze and agitate pads until water coming out of and off of pads runs clear. Place washed and rinsed pads upside down in a well ventilated area. After spraying a liberal amount of cleaner onto the pad, massage the cleaner into the pad with your finger tips and then rinse under a strong sream of warm water. Wolfgang Pad Werks Polishing Pad Cleaner will make your foam, wool and microfiber pads look brand new even after long polishing sessions.